Green is omnipresent on our planet. It covers millions of square kilometers, it pops out of the narrowest crack in the asphalt and it even ends up coloring our dinner plates (hopefully). It’s the color of life, of nature, of calm, of youth and of spring. There is hardly any escape from green it if you draw inspiration from your environment. 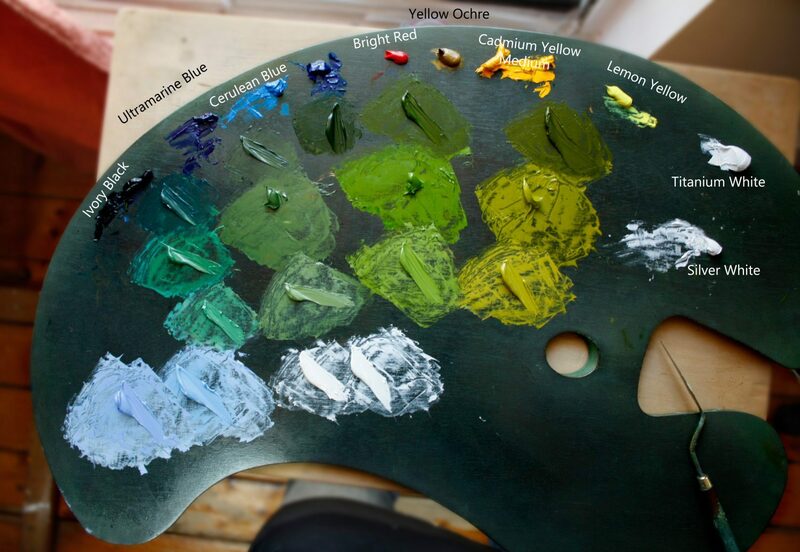 However, in painting, there are two opposing approaches to the use of greens: using pre-made greens or mixing your own with yellows and blues. Recently, I transitioned from the former to the later. There are two types of tubes of green paint: single pigment and pre-mixed. Some tubes contain only one pigment of green such as: PG18 for Viridian, PG17 for Chromium Oxide Green or PG7 for Phthalocyanine Green. 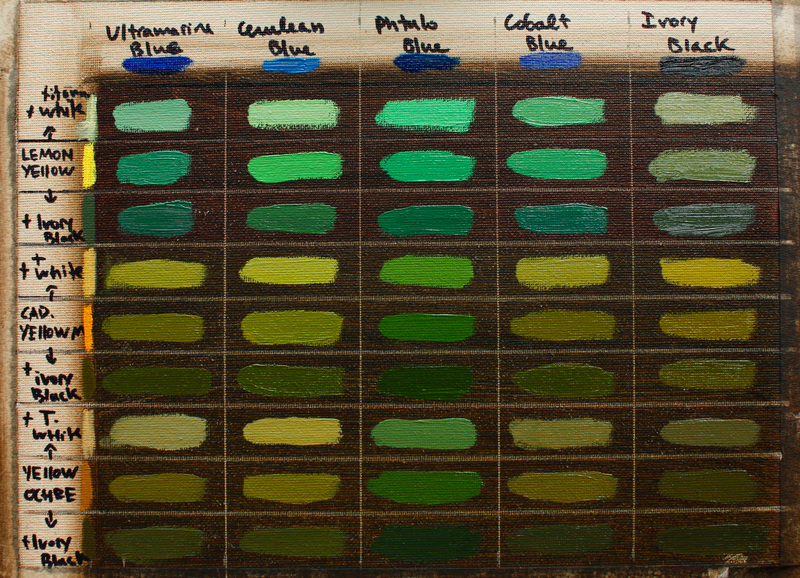 Others contain mixes of blues, yellows and even other colors such as: Fragonard Green by Pebeo (PV19+PY83+PG36), Sap Green by Kama (PB29+PY83+PY3) or Bright Green by Old Holland (PY3+PG36+PB15). Those are strait out of the imagination of the companies making them. In my experience, pre-made greens act as a psychological anchor. They rarely match what you see and especially what you imagine. Yet, most of them, (especially Fragonard Green) look so great out of the tube that it’s easy to be indecisive and afraid to modify them to get a desired effect. That’s not to say that you can’t achieve a beautiful result using pre-made greens. But! You’ll need at least half-a-dozen of them and you’ll need to be ready to tone them down or mix them up to create an appealing variety. 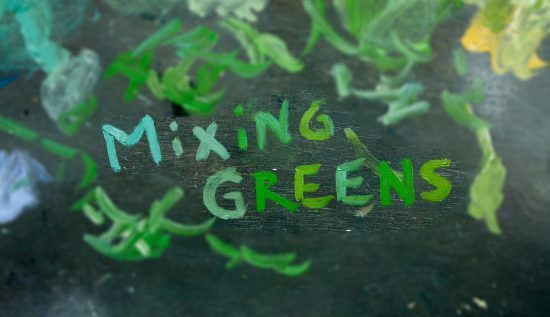 Creating your own greens, on the other hand, nurtures a clear variety on your palette from the get-go. For this you’ll simply need a few yellows and blues. For my first experiment I used: Lemon Yellow by Holbein (PY81+PW5), Cadmium Yellow by Holbein (PO20+PY37), Yellow Ochre by Lefranc (PY42), Cobalt Blue by Old Holland (PB28), Cerulean Blue by Holbein (PB35), Ultramarine Blue by Holbein (PB29) and Primary Phthalo Blue by Pebeo (PB15) and Ivory Black by Old Holland (PBL9). Now, I know this isn’t the “purest” bunch since the Holbein yellows are mixes in themselves. Yet, I think they do not compromise the variety of greens achieved by blending them with blues. Apart from combining colors, I also added white and black to every mix to see what it looks like when it’s lighter or darker respectively. Lemon Yellow is cold. It’s useful to make cold greens. Mixed with Ultramarine it makes a bluish-green; with Cerulean it makes a bright cold green and, surprisingly, with Ivory Black it makes a pleasant subtle greyish green. Cadmium Yellow is the opposite: it’s warm. Mixed with Cerulean it creates a bright warm green, with Phthalo it makes a vivid green, with Cobalt it makes a toned down version of the Cerulean mix. Yellow Ochre is warm yet less chromatic than the other two. It’s useful for less saturated, subtle greens. It makes a less colourful yet still appealing mix with Phthalo and a very-close-to-yellow mix with Cerulean. Ultramarine Blue is usually a very handy color for skies and water. Yet, when it comes to greens it doesn’t have as much power as the other ones. Very few mixes with Ultramarine are as potent as with other blues. Cerulean is considerably lighter than all the other blues in its pure form. Its combination with Cadmium Yellow is noteworthy. Phthalo Blue was the biggest surprise! I had never used it before. By far, it gave the most vibrant greens. But, don’t count on it for subtlety. Cobalt Blue is the most neutral blue (and also the most expensive one). Typically, it is used for cold skin tones. I tend to use it very sparingly. It gives subtler versions of the greens mixed with other blues. Ivory Black is not a blue per se but it has a bluish quality to it. It does make a useful neutral greyish green with Lemon Yellow. That is it for my experiment! As you probably noticed this is only pt.1! There are myriads of other pigments and mixes to play with and even more variations of green in nature. There will be more to come on this subject! Stay tuned to the middle of the spectrum!